Jogging is one of those things that will get you back in shape after having a baby. If you are not up to committing to a gym membership or buying an indoor bike that you’ll probably never use, a jogging stroller is practical, and you will most likely use it as you take baby walks. These best jogging strollers are designed to give you a smooth ride at high speeds even on uneven terrain. They will come in handy to offer your baby a comfortable ride even around corners while keeping them safe. When can you use a jogging stroller? A jogging stroller has three wheels. The two rear wheels are around16 inches wide while the front wheel is around 12 inches. The purpose of the large diameter is to facilitate bumps when riding on rough roads so that your baby will always be comfortable. You will find that they have an off-road appearance which makes long runs effortless. You will need to make sure that the wheels sit evenly on the ground when you place the baby inside. Whether you are using a stroller with one or two front wheels, you will want it to have a locking capability for rough terrain. This prevents the wheels from swiveling sideways which can be uncomfortable and unsafe for the baby. If you are not on strictly smooth terrain front wheels that swivel, make it easy to maneuver through doors and shops. This feature takes care of the pressure from the bumps and effects of running. Jogging strollers will mostly have a rear suspension system. The safest is the five-point harness which holds the baby in a comfortable yet secure position. It prevents the baby from slipping so that you can safely enjoy an active lifestyle. One thing though; it is essential that your baby be six months or older before you start jogging with them. This is to ensure that they have gained enough neck strength and they can sit up in the stroller seat. This is the third most important feature in a jogging stroller or any other stroller for that matter. They are essential in that they keep the stroller from rolling away when you stop to catch your breath or sip a drink. 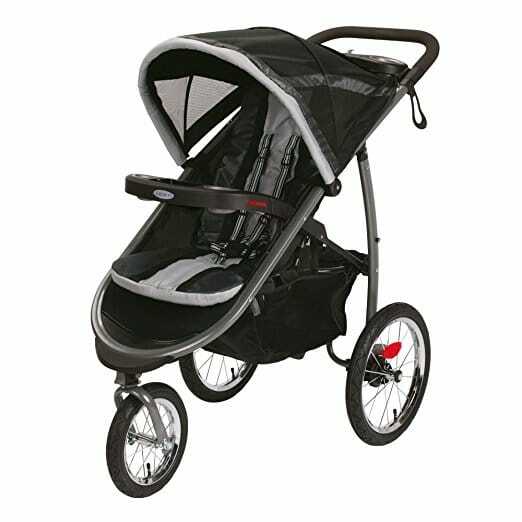 Strollers that have the brakes near the handlebars are convenient as they allow you to slow down when running downhill. Brakes can lock the wheels using one or two actions. You will want to find the most comfortable locking system. A comfortable position for the baby is when they are sitting upright like a pilot. If you are jogging with an infant, you will want the stroller to have a reclining seat so you can achieve the most comfortable position for the baby. Ensure that the leg holes can close so that the baby will not slip through. This allows you and your spouse to use the same jogging stroller by just adjusting the height of the handlebars. If you are taller than your spouse, you will want the handlebars to reach a comfortable height without reaching too high or too low when holding or pushing your jogger. This is a must-have feature as it protects your baby from inclement weather and the scorching sun. 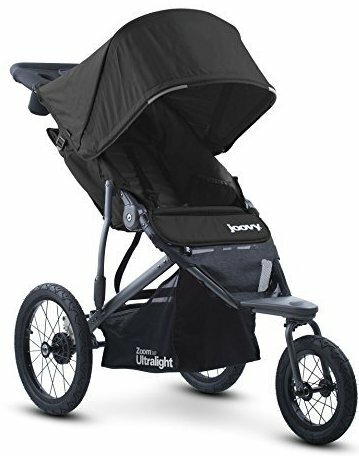 You’ll want an adjustable canopy so that you can turn it all the way back when riding with a toddler or you can pull it all the way down for an infant. 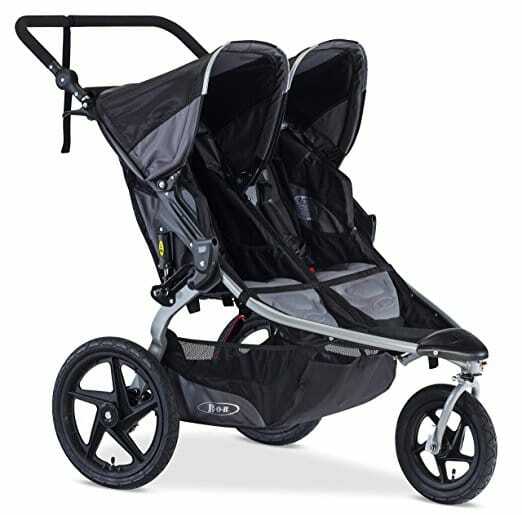 The Baby Trend Expedition Jogger stroller features an incredible design. It uses large bicycle tires that are wide and ergonomically shaped. The wheels have a construction from real rubber which means they can deal with all sorts of terrain including gravel and unpaved paths. You will like that the front wheel can swivel easily when using it on smooth tracks and it is easily lockable for use on rugged terrain. With a 5-point harness, your baby will be well-secured whether you are just taking a casual walk or taking a fast run around the block. It has a multi-position seat which enables you to place your baby in the most comfortable position. It also has a tether strap, and it can accept a Baby Trend Car Seat when you want to make a travel system. We like that it has ample storage for you and your baby. This includes two cup holders on the parent tray and one drink holder on the child tray. It also includes a large storage basket to help accommodate essential baby items. Baby Trend Expedition is a popular model for good reason. It presents flexibility of being able to use it both in the locked and unlocked front-wheel position. This stroller also folds compactly for travel, and it has a durable steel construction. It matches the quality of other expensive models like the BOB Revolution, yet it is very inexpensive. The BOB Revolution SE Stroller is built using lightweight materials. It has three wide wheels which are rubberized to tackle rough paths and trails. You will love that the front wheel can rotate fully allowing you to make quick maneuvers around parks. The front wheel also locks when jogging and with the help of the adjustable suspension, your baby will not feel the bumps on the road. This stroller can accept car seats from different brands. You will be able to use with Chicco, Graco, and Peg Perego infant seats thanks to the accessory adapter. It has a deep seat that can recline in many positions. Your baby can enjoy the outdoors comfortably in the seat’s upright position or lie back to a 70-degree angle where the head and neck will be fully supported. The 5-point harness is padded, and it fastens efficiently using pull rings. This model uses a two-point folding frame. The compact folded size means you are not restricted to just the neighborhood as it can comfortably fit in your car’s trunk. It comes with a rear wheel brake system that smoothly engages using your foot. BOB Revolution SE comes in a durable style. With an aluminum alloy frame and a stain resistant fabric, you are assured of its longevity. It will grow with your baby from the time they are only eight weeks until the time they can run around and take a jog with you. Why we like it: It’s a jogger that doubles as a travel system. This model includes the infant car seat at a very affordable price. Baby Trend offers a two-in-one stroller. It will be useful for walks when the time your baby is in infancy, and during the time you switch up things to jogging with the baby. It uses high-impact composite all-terrain wheels that make it a great find for all surfaces. It will not feel like a drag while walking on grass or gravel. Better still the front wheel is flexible since you can use it for low speed strolling when unlocked and for jogs when locked. This product has two cup holders on the parent’s console. It also includes a covered compartment for the baby. You will like the quality of the canopy as it can stay down even in the wind. This way, your baby will always be protected from the weather. This stroller does not offer an adjustable handlebar. You may find it too low if you are over 6ft tall. Nevertheless, it has other convenient features such as the smooth trigger folding mechanism which allows the stroller to be stored compactly. It is a good companion if you want to take a road trip across the country and still keep up with your active lifestyle while taking care of your baby. With Baby Trend, our expectations are always fulfilled as the features always match the price. We don’t expect it to outlast a Thule or Joovy, but it is a functional model to have for traveling with an infant. Why we like it: A jogger that combines comfort features of a traditional stroller and the flexibility of a jogging stroller. Graco has designed this model for the parent who likes exploring the outdoors. It comes with air-filled tires that can maneuver on all types of terrain. It is going to be your friend on hiking trails where you need more stability on rough paths. The swivel front wheel locks into position to give you more balance and safety. It prevents the stroller from tilting to the side so you will not risk endangering the baby. This model features a fast action, one hand folding mechanism. It folds into a compact size which makes storage hassle-free. Not to mention, it is lightweight to make runs effortless. You will like that Graco FastAction can connect seamlessly with Graco Click Connect Infant Car Seat. There’s no need to stay in the house when you can take your baby out for some fresh air even during their infancy. You will be able to secure the baby with the click system in their car sear. This model also includes a 5-point harness for older babies from six months old. The extra-large storage basket will come in handy for taking diapers, toys, and food. You will also have secure storage for your phone, keys, and wipes on the parent’s console. The child tray is large enough to hold sippy cups and baby bottles. This jogger is not only comfortable but secure for babies weighing up to 50 pounds. It has a sturdy construction and a suspension system which allows it to glide effortlessly on all sorts of terrain. Why we like it: A sophisticated model that includes canopy mounted speakers. Schwinn is famous for their advanced products. The Turismo swivel features a robust aluminum construction alongside a manual locking wheel. The suspension is incredible as it lets your baby sleep comfortably even when you are sprinting since they will barely feel any bumps on the road. The 12-inch front wheel is not only wide but also very secure to hold the weight of babies up to 50 pounds. The rear wheels are also massive making it straightforward to glide on all terrains. The handlebar on the Schwinn Turismo is adjustable in multiple positions. You don’t need to get two strollers for you and your spouse as it provides a comfortable holding position. The handlebar is also rubberized and slip-resistant. Even if your hands are sweaty, you don’t run the risk of losing your grip. One thing we love about this stroller is the built-in speakers. 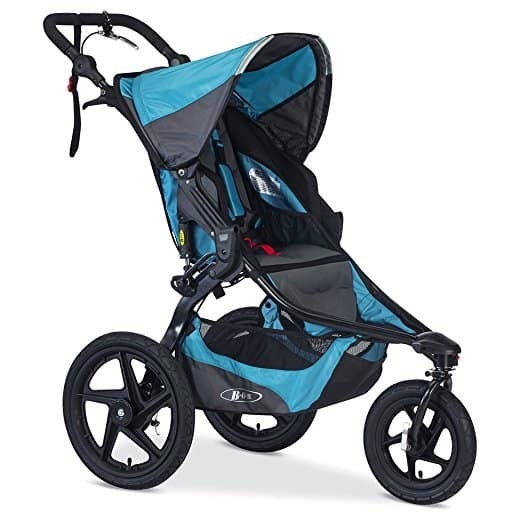 They line the inside of the canopy, and they connect to MP3 players such that your baby can be entertained as you take your run. It also comes with a seat adapter which allows it to be used with infant car seats. Schwinn Turismo is a winner in that it is durable and reliable. It is a breeze to handle thanks to the lightweight aluminum construction. It is designed with molded trays for you and the baby, and it locks manually for smooth gliding. Why we like it: It’s an improved version of the Revolution SE. The features are all updated bringing more convenience for daily use. The BOB Revolution 2016 Flex achieves a high ranking thanks to the straightforward run-ability. It is uniquely designed to navigate through crowds and the ability to take the baby anywhere while attaining superior comfort. It is an all-around model that you can take it for walks or jogs owing to the swiveling-locking mechanism of the front wheel. This stroller is ideal for use by all family members. The handlebars are adjustable in nine different positions. It allows maintaining a comfortable holding position so that you will not experience back issues due to a poor running posture. You will love that it takes the baby’s comfort to a new level. The seat offers a secure reclining system, and it has a better upright position for the baby to watch and experience the outdoors as they ride. The suspension mechanism is also incredible as you can get two stages of weight support and 2 inches of travel. You will also find a better quick-release folding mechanism for the front and rear wheels. This makes it easy to lift and put in the trunk despite its increased weight. It can accommodate a larger weight capacity up to 75 pounds which indicate it is usable with preschoolers. If you are a tall, sporty parent or you are looking for a jogging stroller with an upright seat, BOB Revolution Flex is the real deal. It has probably the most efficient run-ability which makes it a favorite if you are a serious runner maybe training for a marathon. Joovy strives to offer affordable and safe baby products. The Joovy Zoom represents one of their best styles that toddlers will love. It comes with an extra-wide seat which provides a comfy sitting position. You will like using the multiple position seat to help your baby sleep or sit as they would love. You will find the rear suspension extra useful as it takes care of the bumps when you decide to run on off-road paths. It is easily maneuverable as it also offers a swivel action on the front wheels. You will rarely experience trouble trying to keep it on course as it does not veer dangerously. What’s more, it utilizes single-action brakes so you can take a break and the stroller will not roll away. The locking swivel wheel performs with excellence since it does not give in to bumps. Your baby will experience a smooth ride even if it lacks a tracking system. Better still, this jogger has a padded handle meaning it is possible to stay out for hours and your hands will not feel sore. This stroller has quick-release wheels. They facilitate compact storage as you won’t be struggling with a heavy frame when lifting it up the stairs or to your car. It also comes with an auto-lock feature to keep the stroller in the folded position once it is collapsed. The canopy is not only wide but also adjustable. It protects your baby from the scorching sun and wind. You can bring in a car seat for an infant, so you don’t have to wait until they are six months to take casual walks. Joovy Zoom has created a beautiful jogging stroller with all the correct features. It is lightweight, durables, easy-to-use, and above all safe for your baby. It includes comfort elements like a parent organizer and a suspension system for a smooth ride. Why we like it: Easy to maneuver and comfortable for two kids. It’s also made with high-quality materials. 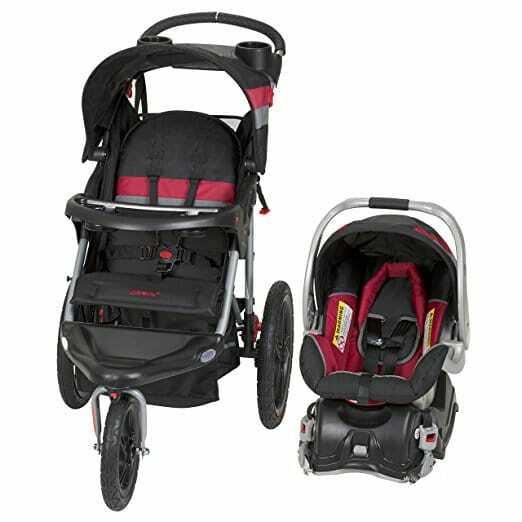 If you a mother of twins or you have been looking for a good double stroller for two kids, BOB Revolution Flex Duallie puts out this exception double jogger. It ticks all the boxes for the best features to look for in a double stroller. This includes the all-terrain strolling and the versatility of being able to maneuver from smooth to rugged surfaces. This model uses pneumatic rubber tires with adjustable suspension and tracking. The locking swivel front wheels make it easy to run and keep your babies comfortable. Each seat can recline independently such that if you have kids of different ages, you will be able to place each of them in the ideal position. The seats come with individual canopies alongside peek-a-boo windows. You can watch over your kids as you run so that you are aware if they are sleeping or seated comfortably. The 5-point harness is also very easy to use. It is padded and adjustable to meet each baby’s comfort. This stroller uses a two-hand folding mechanism. You will have about 4-6 steps, but they are easy to follow. Your stroller will be stowed away in less than 3 minutes. However, you can’t take it on public transportation as it has a wide girth meaning it only goes in your car. This model gives you absolute pleasure to use it. The design is comfy for kids, and also ideal for you. From the rubber tires to the adjustable suspension, it goes to say that even with two kids you can still achieve an active lifestyle. Why we like it: Safely constructed to ease the fears of running with a baby on board. It has a durable construction to facilitate strolling and running on smooth roads and off-road trails. This model has excellent mobility on gravel. It is a great option if you want to run on unpaved surfaces while carrying a heavy child. BOB 2016 Revolution Pro features a locking swivel front wheel complemented by an adjustable suspension and tracking capability. It can quickly be set to run in a straight line so that it will not swivel dangerously when it hits a bump in the road. This stroller utilizes a handbrake for the rear wheels. It is easy to engage especially when running down a steep hill. With the adjustable handlebars, it doesn’t matter what your height is as it will provide you with an ideal position for the hands. The engineering of this unit sees a model that bounces smoothly on and off gravel. With the suspension system, your baby will barely feel a thing when they are sleeping soundly. You can adjust the suspension to accommodate a big kid like if you are riding with a child who is over 50lbs, they can ride safely using the tighter suspension. The reclining seat is more than comfy. It sits deep and is well-padded with lots of leg room. It can still accept an infant car seat if you are looking for a stroller that you can use for walks and later use for running. This unit is more cumbersome than other jogging strollers, but this does not affect its run-ability. The hand-activated rear brakes are unique to allow swift breaking. If you want a multi-purpose jogging stroller, BOB 2016 Revolution Pro will not disappoint. Why we like it: A stylish and lightweight carrier with perfect mobility on smooth terrain. You can push this stroller at any speed making it the most convenient for daily use. 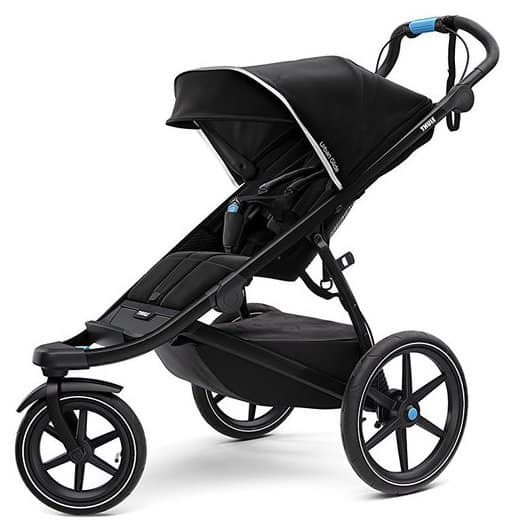 The Thule Urban Glide 2.0 is a model that is thoughtfully made as it considers the comfort of both the parent and the baby. It is lightweight allowing it to achieve an efficient running ability for even pro-athletes to use comfortably. Since it is small, you will find it very easy to maneuver through crowded places and even in public transport. This model has an adjustable crotch strap. You will be pleased that your baby will always be secured even if they are tall for their age. It glides smoothly without any wiggling, shaking or lateral movements at high speeds. This makes it a good companion for paved surfaces since it does not perform very well on rough roads. Nevertheless, you have a stroller that is well-engineered to achieve absolute safety for you and the baby. This stroller allows adjustable tracking. You can align it in a straight position once the front wheel locks which assures you it will never veer off the road. Instead of using a U-shaped handlebar, this model has a handlebar that curves in. This way, your hands are in neutral position; thus the onset of fatigue is delayed. The handbrake swivels in an intuitive direction making it fast to apply instead of a squeezing mechanism which can be difficult to control. 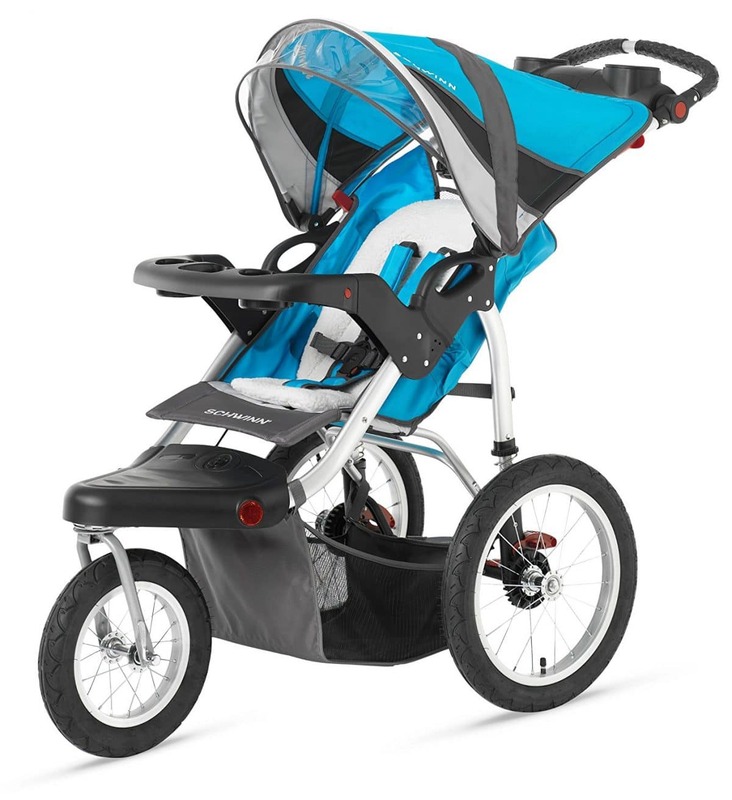 Thule Urban Glide 2.0 has done due diligence on this jogging stroller. It meets our expectations in terms of safety, flexibility, comfort, and value for money. Are you a pro-athlete or a mum who likes taking morning jogs? Don’t stop after the baby comes. Here’s your guide to buying the ideal jogging stroller. If the only need for a stroller is taking a walk around the block or picking groceries, a jogging stroller is not a good buy. But if running and taking brisk walks is in your mind, then you need a good jogging stroller to fulfill that exact purpose. A jogging stroller is designed for speed. It takes into consideration the safety and comfort of both the baby and the runner. These strollers come with three large, fixed wheels, suspension systems, tracking capability, reclining seats, canopies, and 5-point harnesses to secure the baby. 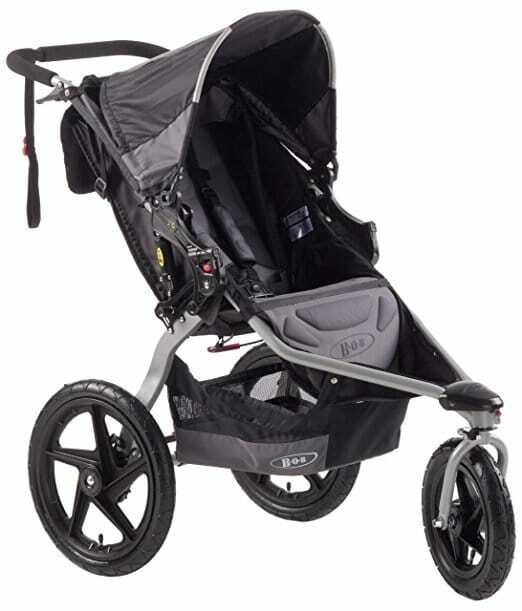 Jogging strollers are versatile since they can double as a regular stroller for daily walks. They also allow attaching of an infant car seat so you can use the stroller from the time the baby is in their infancy. But you cannot use the stroller for jogging when the baby is less than six months. Some pediatricians advise using a jogging stroller when the baby is eight months old. At first, pushing a stroller and running at the same time seems like an awkward and impossible adventure. But wait until you get it right. It helps you to get a good sense of your stride so that you don’t over-stride thus you will always be in control. You will notice the difference when running without a stroller since it becomes more comfortable and you realize you can go faster. Running helps to introduce the baby to you and your passion. This includes a healthy and active lifestyle which will help your baby know the important values at a young age. You also get to interact with your baby as you run helping them to soak up the scenery and be relaxed in the outdoors. Running with a stroller takes much more physical exertion. It will require that you push harder because you can’t abandon the stroller and walk the rest of the way. This will blast more calories, and you can be closer to your goals sooner than you think. You will need a stroller that maintains its form on the surface you will be using it. You don’t want your baby to be bounced around while the stroller risks tilting over. That’s why you need a model that distributes the weight correctly to aid in maneuvering. If you are on rugged terrain, the fixed wheel position should not show any signs of wobbling. This will keep the stroller in a straight line such that you won’t be dealing with a stroller that keeps veering off the road. The weight capacity of a stroller is usually associated with the suspension system. If too much weight is applied, the suspension may give and render it useless. You should always check the manufacturer’s recommendations as some of them are stringent such that little additional weight can offset the run-ability of the stroller. You will need a folding stroller when traveling and for compact storage. Here, the stroller should fold in straightforward steps so you can take care of the baby and the stroller at the same time. Some strollers use one-step folding systems while others use two-step actions. After the stroller folds, it should not pop back open when it is in the trunk. An auto-lock feature could be convenient for models that can unfold. You’ll probably be out longer than 30 minutes at a time. A lot can happen in this short time from the baby needing a diaper change to you needing a sip of water. This is where storage comes in. you will want a stroller with a large storage basket or bin to accommodate all the baby essentials. The stroller should also come with convenient spaces for water bottles and the baby’s bottle. All the stuff you store including your phone should be easily reachable. We found the BOB Revolution models to offer many storage options. Here’s how to assemble a BOB Revolution stroller. How durable is the stroller you are investing your money? It is important to look for a high-quality model with construction from either steel or an aluminum frame. Also, the wheels and tires should be of good quality including being rubberized and air-filled. Watch out for strollers with many plastic parts as they are going to come apart upon impact. The quality of the fabric is also another important thing since it is the place where you are going to change the diaper or even feed the baby when you are out and about. You’ll need a stroller with a removable seat pad for washing or one that can easily be wiped. 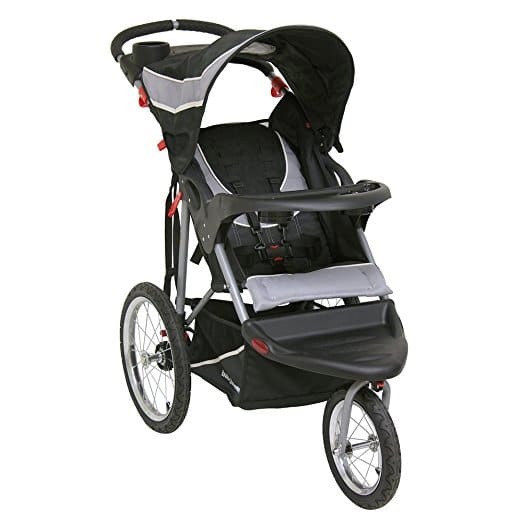 A good jogging stroller provides you with a relaxed ride for you and the baby. Our top picks are the best in their categories for good reasons. These models go far and beyond to achieve stability, safety, and comfort for the baby and you. You will find affordable strollers with minimal features while others are high-end, but they come with additional functional features. Let these jogging strollers be your best companion for outdoor workouts.